Space shuttle Enterprise, as it appeared in July 2012 inside its original pavilion at the Intrepid, Sea, Air & Space Museum in New York City. A new pavilion and expanded exhibit is set to open on July 10, 2013. Space shuttle Enterprise is ready for its re-debut. 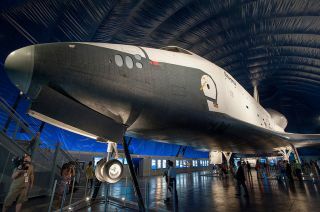 NASA's first winged orbiter, a prototype spacecraft used in the late 1970s for atmospheric flight and ground tests, space shuttle Enterprise will reopen on display Wednesday (July 10) at the Intrepid Sea, Air & Space Museum in New York City. The space shuttle Enterprise, however, remains the centerpiece. The exhibit includes a larger observation platform, atop which guests can get nose-to-nose with the prototype orbiter.